When the warmer weather rolls around, dogs can easily get overheated and dehydrated. They struggle to cool themselves efficiently as they have fewer sweat glands so can only regulate their body temperature by panting, which just doesn't do the job in warmer weather. And any loving owner will hate to see their beloved pet suffering in the heat. 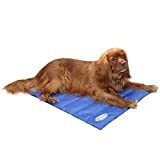 Cooling mats and pads are a fantastic tool to have in your dog owner's kit, and your dog will certainly have a more enjoyable summer. You can use cooling pads inside or outside to regulate your pup's body temperature throughout the day, wherever they happen to be relaxing. Some cooling pads require electricity to work but most designs will be filled with special foam and crystals that hold the water and keep cool without needing to be hooked up to the mains. The pad will work through the basic rules of thermodynamics to provide an area that is cooler than your dog's body. The pad absorbs the heat from your dog and disperses it into the atmosphere. If you're heading somewhere warm with your pooch, a cooling pad will be his best friend. Pack it in the car for use on the beach, during picnics and even while you're making the journey. Placing the pad at the bottom of your dog's travel cage or on their bed will provide them with much-needed relief in a warm car. If you ever need to leave your dog in the car for short periods of time, a cooling pad is a wonderful place for them to rest and stay cool. Though you must still remember to crack a window, of course! Look for cooling pads that do not contain any harmful or toxic chemicals to further protect your pet. Gel pads are a particular favourite as they automatically react to body heat, they don't need to be refrigerated and you don't need to worry about them leaking. 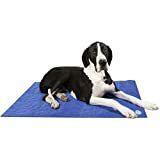 Cooling pads come in a variety of sizes so you'll be able to find the perfect shape for your dog. 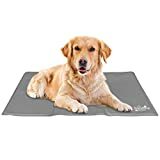 Bear in mind they're likely to spread out on their new mat so you need to make sure their whole body fits comfortably on the surface. Most designs are activated by pressure so they will get to work as soon as your pup flops down to chill out. 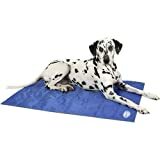 You may need to tempt your dog onto the mat at first, wary as they can be of anything new! 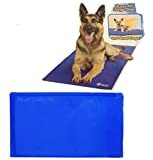 Try positioning the mat in their favourite place and popping a toy or some treats in the middle. It won't be long before they're exploring their new mat and enjoying the relief it brings. Some cooling pads will only cost you around £10 but the more deluxe designs can cost up to £50. The more you spend, the more durable the design is likely to be. If you have a larger pet or are worried about clawing, it's worth spending a bit more to ensure your pad will stand the test of time.